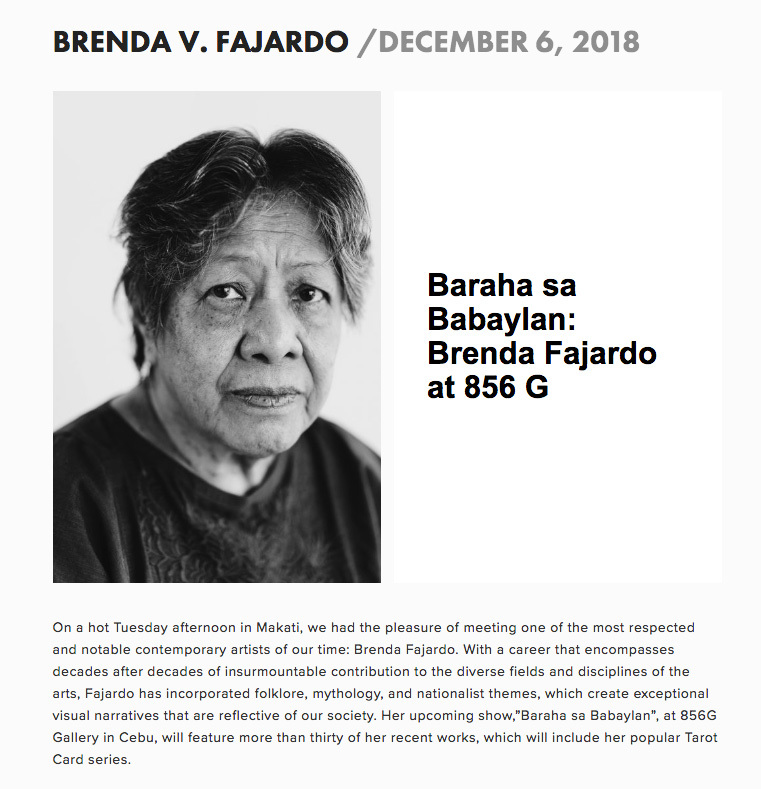 On a hot Tuesday afternoon in Makati, we had the pleasure of meeting one of the most respected and notable contemporary artists of our time: Brenda Fajardo. With a career that encompasses decades after decades of insurmountable contribution to the diverse fields and disciplines of the arts, Fajardo has incorporated folklore, mythology, and nationalist themes, which create exceptional visual narratives that are reflective of our society. 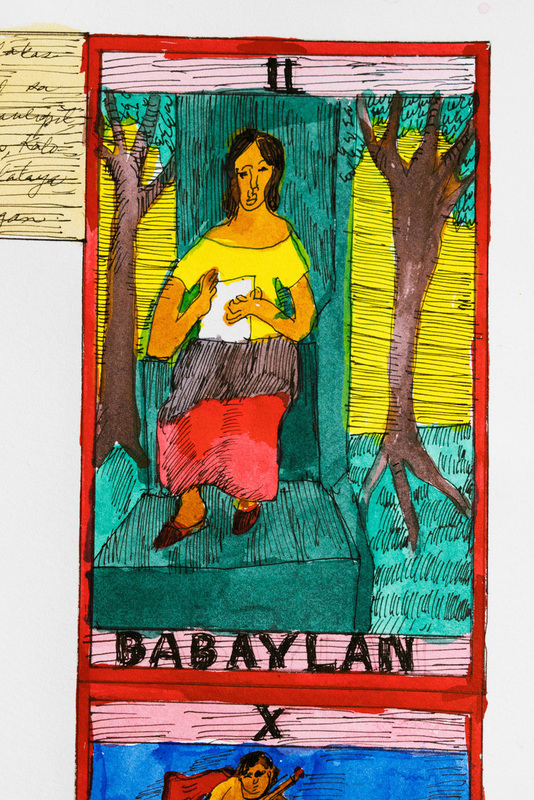 Her upcoming show,”Baraha sa Babaylan”, at 856G Gallery in Cebu, will feature more than thirty of her recent works, which will include her popular Tarot Card series. Starting her career in the visual arts as a printmaker, Fajardo tells us how her brother (who is now an architect) had inspired her to become an artist. “I should probably tell him before he dies,” she jokingly remarks as she looks back on how his paintings of seascapes and ships had eventually led her to aspire to become an artist one day. Years after, she found herself working with graphic design and printmaking. 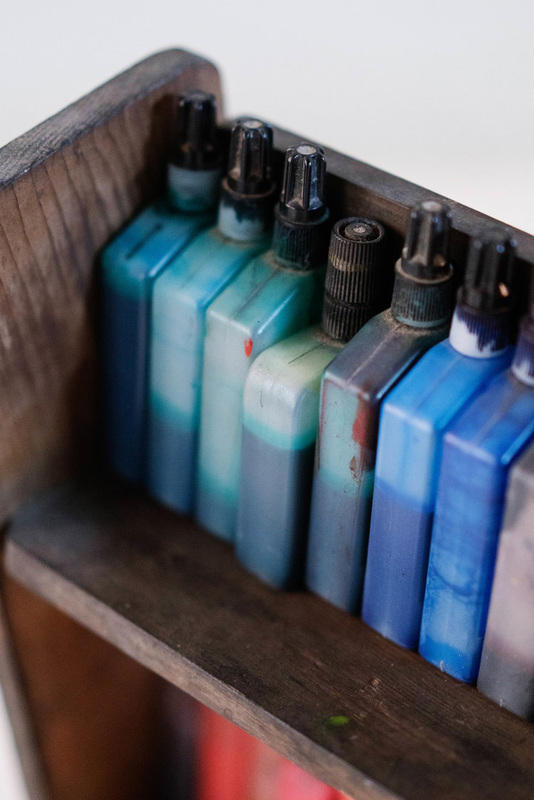 She muses, “I had a press before for the metal (plates): the etching --- you work with acid; the other one is for engraving --- you work directly with the metal. But the engraving was difficult. So, in the beginning when I was doing these projects, I wanted the drawing to become an etching because it was intended to become a print and when I saw the end product (drawing), I said, it can stand for itself, so I just kept going.” Sometime in the 80s, Fajardo had her first solo show at the Cultural Center of the Philippines. Around this time, she became interested in tarot cards while studying Philippine History. The CCP later awarded her with the prestigious Thirteen Artists Awards (1992) and the Gawad CCP Para sa Sining (2012). Her works have been featured in local and international exhibitions primarily in Japan and France. Weaving socio-political struggles and historical themes into her body of work, Fajardo’s most recognized works lie among her original take on the tarot card where the association between the spiritual and material world becomes concrete. For example, a card called “The Fool” from the western deck is visually translated into its female indigenous version, “Ang Gaga”. Fajardo explains that for her, the card symbolizes the Babaylan, who is a mediator between the material and spiritual world. This insight brought us to talk about Papa Isio ---a prominent figure from her home province of Negros. Papa Isio was a Babaylan during his time but was also a revolutionary icon who fought against the Spanish and American colonizers: a proof that our spiritual needs align with that of our practical needs. Charged with indigenous portrayals of lore and sometimes mysticism, Fajardo’s works also speak of pressing national issues. She usually starts with a drawing of her own version of the tarot card, then, she either writes on the drawing or starts to work with the central image. 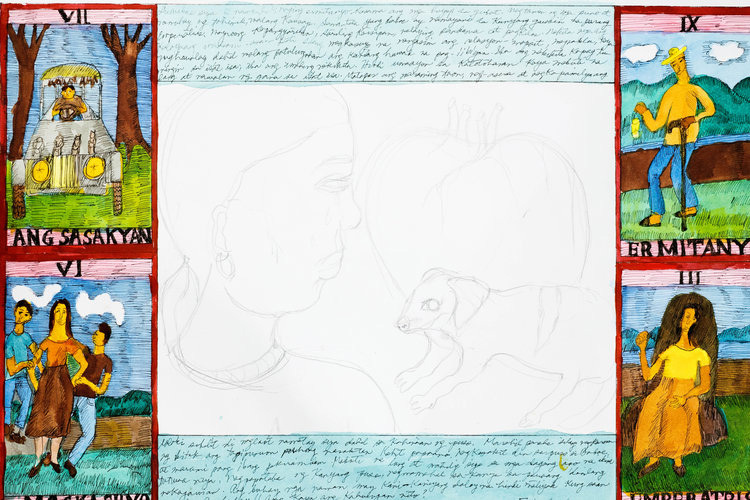 The writings on her works serve as a visual device not meant to be read but to be experienced as an image, subsequently adding the central panel, which completes the mise en scène: powerful illustrations of the stories and circumstances of the ordinary Filipino. 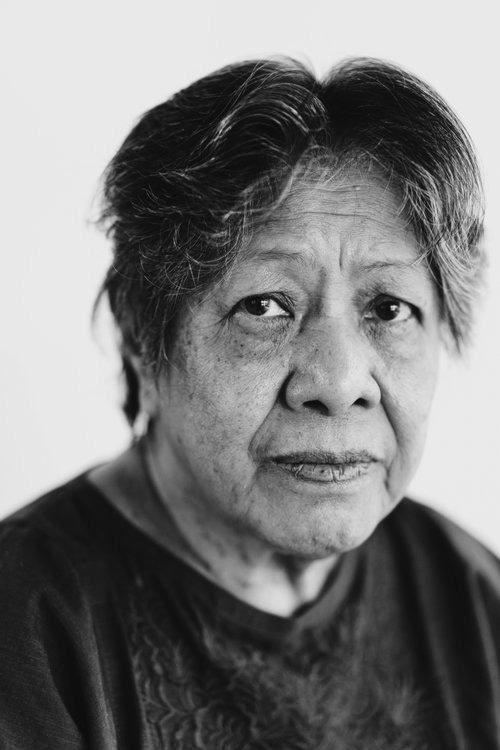 In the 90s, along with her female contemporaries, Fajardo had established the art collective KASIBULAN (Kababaihan sa Sining at Bagong Sibol na Kamalayan) together with Imelda Cajipe Endaya, Julie Lluch, Anna Fer, and Ida Bugayong. KASIBULAN advocates for the advancement of women’s rights through the arts. Although many women artists were hesitant to join their collective for fear that they would be tagged as feminists in the wrong context, many became involved after the definition of feminist was clarified as “someone who fights and stands for women's rights”; men, thus, can be feminists, too. KASIBULAN became a powerhouse collective, which is keen on advancing women’s rights and opportunities in and out of the art world. Fajardo’s paintings would often feature women and their place in history and the current times. Humor is not lost with Fajardo and her works that include satirical images; Sangandaan series (2003) shows an embodiment of the motherland in a female body spanking a man who seems to be a representation for Uncle Sam (American colonization). In another work, Paghigugma sa tagsa-tagsa, pagpalangga sa pamilya (1997), is an image of four tarot cards with the women as the Major Arcana (Ang Gaga, Babaylan, Kahinahunan, Daigdig); the center of the image portrays a scenario in domesticity. Fajardo says her works are, perhaps, fragments that are part of her past, present, and maybe future; not exactly a timeline but a narration of her many experiences transformed into striking and powerful images that are reflective of contemporary events. She also tells us that in her forthcoming show, hints of her dog, Noodle, will likely be in some of the drawings. Noodle was also family to Fajardo and lived with her for many years. These days, though, she is comforted by another dog she cleverly named Eldoon (as in reverse of Noodle). Fajardo looks at 856G’s Fussner brothers and tells them about the importance of meditation. She sends us instructions to reflect each day and think in reverse. She says one must be able to understand how s/he thinks by remembering all the decisions and actions done backward. She believes that art is a spiritual identity; as an art educator, Fajardo helped bring Rudolf Steiner’s Waldorf School in the country. The school teaches non-biased thinking and integrates the arts with other academic subjects. Although her career has transcended as well in the field of theater (she served as a production designer in the past) and other platforms, Fajardo’s passion remains to be centered in arts education. Even if her brilliance as an artist has been recognized by important institutions, Fajardo still insists to call herself, above all, an educator. 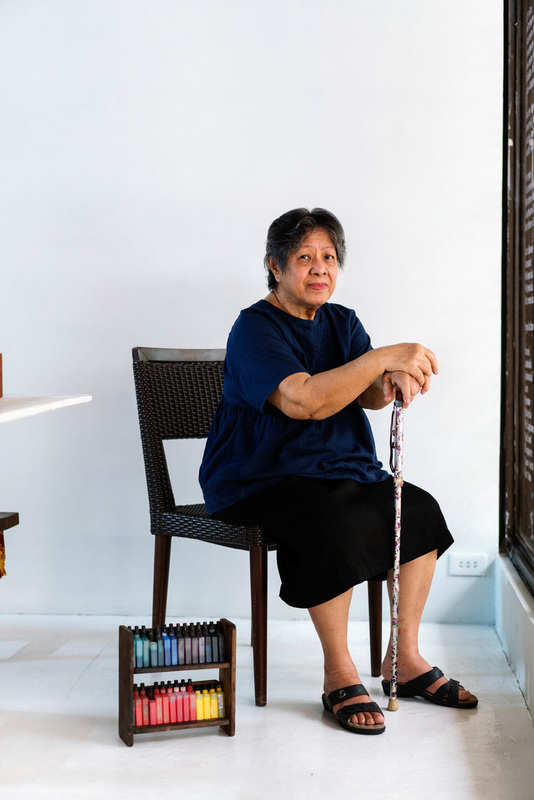 As a Professor Emeritus at the University of the Philippines in Diliman, she has shared her legacy with generations after generations of artists, curators, writers, cultural workers, and art educators who have committed themselves to bring art into the everyday lives of the Filipinos. Brenda Fajardo’s contribution to the progress of arts and culture in this country is unparalleled and incomparable. 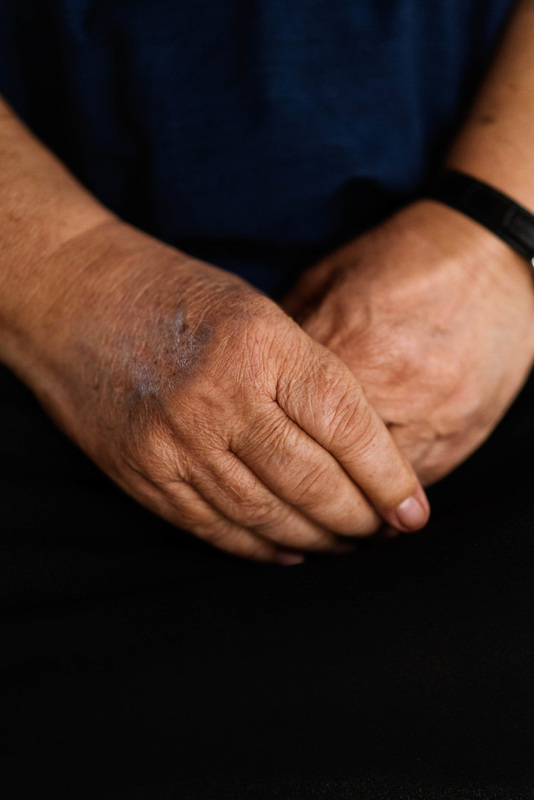 Her life’s work is devoted to making the invisible visible; the marginalized to question margins; the helpless to become empowered. These are just a few of the things she dealt with her deck of cards ---the fortunes displayed at the helm of history and of the present.